Raaga.com: Music director Aadesh Shrivastava critical; Lata Mangeshkar prays for his life! 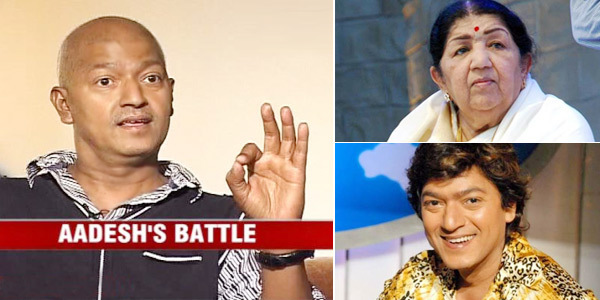 Music director Aadesh Shrivastava critical; Lata Mangeshkar prays for his life! Melody Queen and Bharat Ratna, Lata Mangeshkar has expressed her anguish for music director Aadesh Shrivastava, who is battling with cancer at Mumbai’s Kokilaben Dhirubhai Ambani Hospital. “He is not responding to the medicines and injections but we are hopeful that with more doses he may recover. This is a massive relapse and we are hoping he will pull through,” informed a doctor. Initially the family had hidden the news from media but no sooner the news was out many personalities from Bollywood have been pouring to express their concern. Prominent among them are singer Sonu Nigam, Shaan, Shekhar Suman, lyricist Prasoon Joshi, film director J.P. Dutta, Shekhar Kapur, Suchitra Krishnamoorthy, Poonam Dhillon, Anu Mallik, Jaspinder Narula, Abhijeet and many others. In fact even the Bachchans along actress Shilpa Shetty and Preity Zinta have visited him. Aadesh Shrivastava has composed music for many super hit films like CHALTE CHALTE, BAABUL, BAGHBAN, KABHI KHUSHI KABHIE GHAM, and RAAJNEETI among others. Raaga.Com prays for his quick recovery.